Stay tuned for next week's video on multi-pass testing which will cover ISO 16889, the industry standard test; ISO/CD 23369 Cyclic Flow Test, which is proposed to replace the current standard test; The Cyclic Stabilization Test; and Hy-Pro's Dynamic Filter Efficiency (DFE) Test. Hello, I’m Dustin with Hy-Pro Filtration, and in today’s video, we will be discussing Multi-Pass Testing, what it is, as well as define and explain some common terms associated with it; so, let’s get started. Multi-Pass Testing is a broad term that is used to define the type of testing utilized in the hydraulic and lubrication industry to measure filter performance. It is called “Multi-Pass” because the fluid that is used to test these filters is recirculated through the filter multiple times. Multi-Pass testing is a controlled laboratory testing method, so it is suited best for repeatability and for the comparison of different filters, not as an example of “real-world” filter performance. There are four main types of Multi-Pass testing, which we will discuss at further length in our next video. Some of the common terms that we will be defining and explaining, related to Multi-Pass Testing are: Steady-State Flow Rate, Cyclic Flow Rate; Differential Pressure; Beta Ratio; and Dirt Holding Capacity. Steady-State Flow rate is defined as an unvarying condition in a physical process, in this case, the flow of test fluid through a system testing filter performance. When a Multi-Pass test utilizes Steady-State Flow rate, the rate is chosen by an operator and verified through a flow meter in the testing system and measured in liters per minute. This rate is to stay constant for the entirety of the test and must be documented properly to ensure correct result calculations. Cyclic Flow Rate is defined as a change in the current of test fluid occurring in cycles; Multi-Pass tests that utilize Cyclic Flow Rate require operators to choose a cyclic ratio of current change normally between two to one or four to one. These ratios will stay consistent throughout testing and offer a one-step-closer approach to “real-world” filter performance results by showing the slough or shedding of particles from filters being tested during current changes in the test fluid. 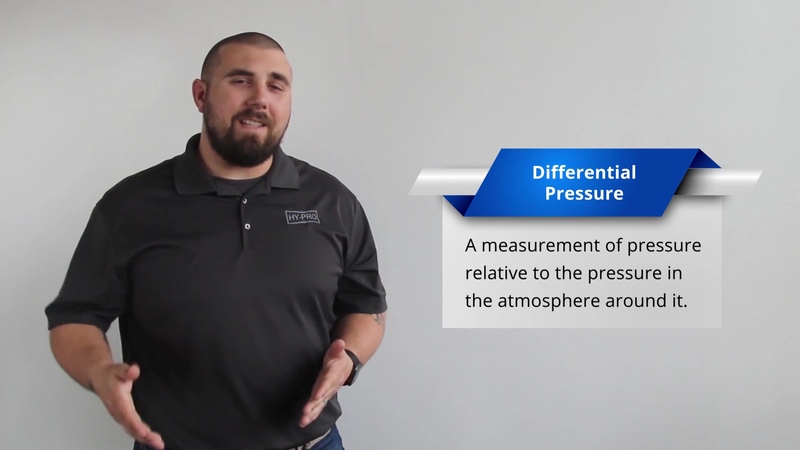 Differential Pressure is defined as a measurement of pressure relative to the pressure in the atmosphere around it. In this case, differential pressure would be referring to the measurement of pressure within a test filter relative to the pressure surrounding the filter inside the housing in which it has been installed. Differential pressure is used in the hydraulic and lubrication filter industry to determine how efficiently fluid is moving through a filter, when differential pressure is high, it is a good indication that a filter is close to being at capacity and should be changed. Other terms that might be associated would include: Clean Differential Pressure, which refers to a newly installed filter's starting differential pressure; Operating Differential Pressure, which refers to the changing of Differential Pressure throughout the life of the filter; and Terminal Differential Pressure, which refers to the Differential pressure limit in which the filter is at capacity and must be changed. Beta ratio is defined as the efficiency of a filter’s particulate removal capability. That efficiency is expressed as the Filtration Ratio or Beta, which is the relationship between the number of particles greater than and equal to a specific size of micron, counted before and after the filter during testing. Dirt Holding Capacity is defined as the amount of actual contaminates contained inside of the filter at the time of Terminal Differential Pressure. There are a number of ways that this result is derived and differs from one test to another, we will discuss this further in our next video. This has been a brief introduction into Multi-Pass Testing, we hope this video has been helpful. Make sure to stay tuned for our next video which will cover in depth the different types of Multi-Pass Testing and their advantages and disadvantages.